Below you will find our Plan for the Day After and a report on our Rally on the day after the explosion in Heimdal, ND. This is simple everyone…. 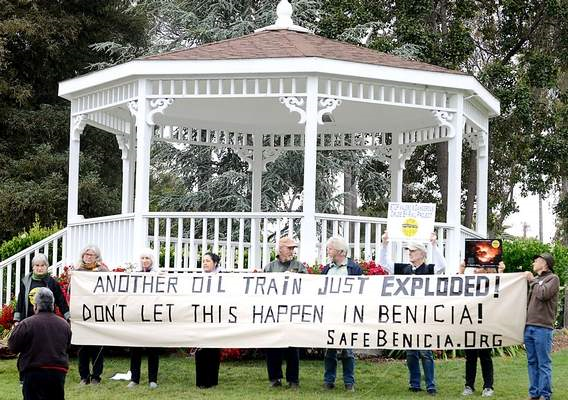 On the very next day after news of yet another big oil train derailment and explosion, gather in City Park at 11:45am. 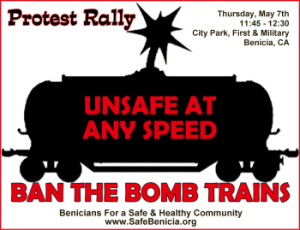 Benicians for a Safe and Healthy Community will send out an email notice (and media alert) on the day of the explosion, announcing the Rally. Bring your Stop Valero’s Dangerous Crude By Rail yard sign or a sign of your own making; bring a family member or friend; but mostly just bring yourself and your positive presence. We will not be discouraged. Our presence adds to awareness in our community and beyond: we stand in solidarity with all who live along the rails where dangerous crude oil and other hazardous materials are being moved – and we bring attention to the horrific stripping of the land where oil is being fracked in the Upper Midwest, and where tar sands oil is being strip-mined in Canada. If you are not already on the SafeBenicia email list, please send an email with your name, phone and email to StopCBR@SafeBenicia.org. May 7, 2015 – Another Oil Train Just Exploded! May 7 was a Wednesday, so the short-notice turnout was light. Still, 21 of us gathered in City Park on a weekday morning, and two news media reps showed up. BSHC spokesperson Andrés Soto spoke, as did Marilyn Bardet and several rally attendees. Passing cars honked and gave thumbs-up, pedestrians stopped to talk and to offer encouragement and thanks. The photo above appeared in the Vallejo Times-Herald. STAY TUNED – regrettably, there will be another Next Big One. The Plan for the Day After will undoubtedly need to be exercised again in coming weeks or months. To be added to BSHC’s email notification list, go to SafeBenicia.org.